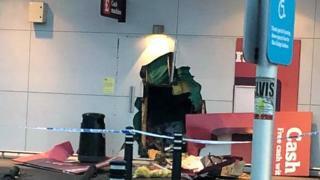 Ram-raiders who tried to steal a supermarket cash machine were forced to flee after it became stuck on the shop floor. Police said three or four men used a tractor unit and white Ford Transit van to rip the machine from the wall at around 01:40 BST. Officers said the machine then appeared to fall to the floor of the Sainsbury store on Stainsacre Lane in Whitby. The men abandoned their attempts to retrieve it and fled.